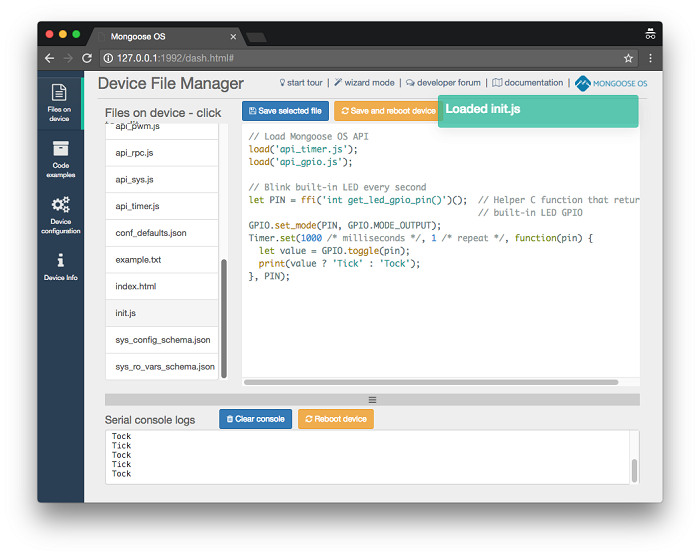 An intro to microcontrollers, and how to build an IoT project with Mongoose OS. IoT (Internet of Things) is about connecting physical objects ("things") to the Internet. Technically, this is done by attaching a computer to a "thing." A computer is attached in a way that it can read data from the thing and report to the Internet, and also it can receive commands and control the thing's state. Usually, the COMPUTER is directly wired to the THING, and the COMPUTER <=> INTERNET connection could be either wired (e.g., Ethernet), or wireless (e.g., Bluetooth, Wi-Fi). What could the computer be? It could be your laptop or desktop computer—both expensive, power hungry, and large. You can hardly use your laptop with your fitness tracker while running. It could be a small single-board computer like the Raspberry Pi, which costs around US $30, BeagleBone for approximately US $60, Intel Edison for US $70, or other similar devices. These computers usually run Linux. These are suitable for some tasks, like being a gateway device, but again they are quite large, very power hungry, and too expensive to run on things like sensors, wearables, and small appliances. It could be a microcontroller (also called MCU or micro). The microcontrollers on the market are extremely diverse and designed for various needs. For the IoT, you have available to you a wide range of inexpensive, low-powered, tiny microcontrollers. Microcontrollers do not have much memory and processing power, which is why they are so inexpensive. For example, the Nordic Semiconductor's nRF52 has 64K RAM and 512K flash. A popular ESP8266 has about 40K available RAM, which means you can't run software like Windows, Linux, or Node.js on them. Because these small computers have such limited resources, programming them can't be done with conventional tools and frameworks. Navigate to the Mongoose OS download web page and download the mos tool. Click on init.js file, change the message Tick to Hello! and press the "Save and reboot device" button. You'll see a new message in the device log. This simple flow demonstrates how easy it is to start with the microcontroller development and Mongoose OS. 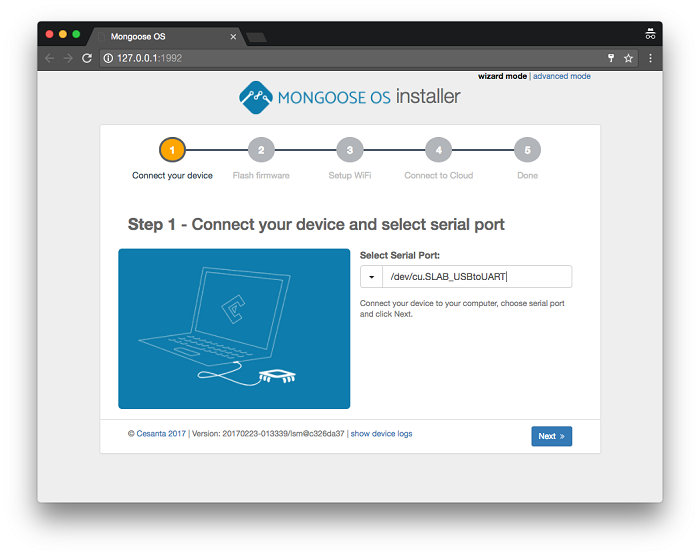 This two-minute installation how-to video from Mongoose OS covers all these steps. Find other projects that use Mongoose OS here. Also, check out how easy it is to build your prototype with the Mongoose OS, the ESP8266, and Seeed Studio Grove sensors. For a more in-depth introduction, see the Mongoose OS documentation and video tutorials. Will this run on a raspberry Pi ?? The supported microcontrollers now are: ESP32, ESP8266, TI CC3200, STM32 Nucleo F746ZG, STM32 Discovery F746G. Mongoose OS does not support Raspberry Pi. Can I do arduino coding in Mongoose OS, like using arduino libraries and functions ? If yes, then how? We already provide some Arduino API compatibility, so you should be able to use simple things like `digitalWrite` right away. At the moment it is rather limited, but we plan to expand compatibility. It should be possible to add Arduino drivers to Mongoose OS firmware directory as is. Would love to see some demos/videos using STM32 Discovery boards.